If you’re anything like me, there’s nothing worse than being stuck at work not knowing what to do for lunch. By the time for lunch rolls around, you’re ready to eat just about anything, and at that point, good decisions go out the window. Sound familiar?​ Yup, me too. The best solution to save us all is to just create a way where we can have a guess free lunch when that time rolls around! The recipe below definitely makes PLENTY for the whole family to enjoy more than once. In a large bowl, combine cubed chicken and pesto. Cover, refrigerate and let marinate for at least 1 hour and up to 1 day. 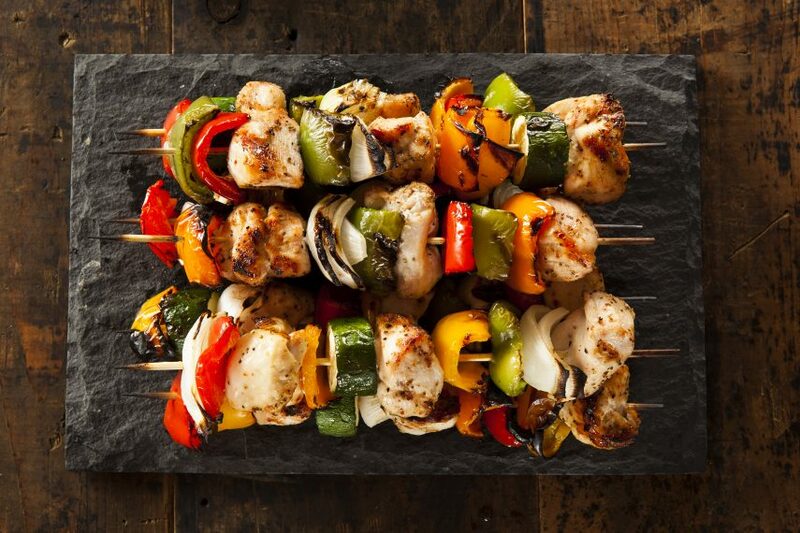 When ready to cook, thread chicken and veggies onto skewers, alternating each as you go. Preheat outdoor grill or indoor grill pan over medium heat. Lightly grease grates with nonstick cooking spray. Once hot, place skewers on grill and cook for 3-4 minutes. Flip and continue cooking until chicken is cooked through 2-3 more minutes. To the bowl of a food processor or blender, add all ingredients except for olive oil. Blend for 30 seconds, scraping down the bowl as needed. Slowly stream in all olive oil while the machine is running. Process until smooth. Don’t play the guessing game when lunch time rolls around. Take this recipe and make life easier and more enjoyable for you mom!